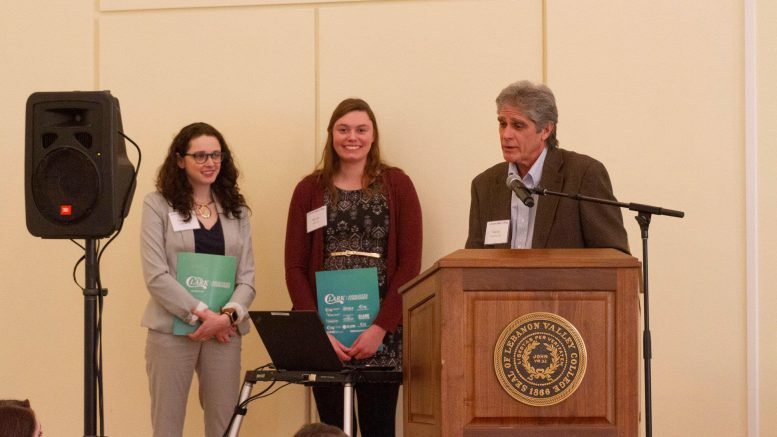 For the second year in a row, Clark Associates gave out two $5,000 scholarships plus a paid internship to LVC students. Clark Associates is a collective of dynamic companies leading the food service industry in equipment, supplies and services. Clark has hired more than 13 LVC alumni, just in 2018, for various roles within the company. Last year was the first year they partnered up with LVC to give out two scholarships plus a paid internship. This year’s recipients were chosen Thursday, Feb. 21, during a luncheon at The College. One of the recipients was Gabrielle Cressman, a junior economics major and business administrations minor. The other winner was Nicole Flohr, a global studies and politics dual major. There was a total of 26 applicants; the applicants were from various majors including education, sociology, business administration and digital communications. Of the six finalists interviewed, the committee picked two to win the scholarship. Sarah Bartz, associate director of career development, was thrilled students took the opportunity to apply to for this scholarship. “Clark has been a long-standing partner of LVC for many years, and we feel very fortunate they have decided to continue with this scholarship opportunity for our students for a second year,” Bartz said. Bartz also hopes to see this collaboration and scholarship continues. For more information on other internship/scholarship opportunities, visit the Breen Center for Graduate Success.